Arrival at Port Blair in the morning/ afternoon by flight and transfer to hotel. Do note that Ross Island is only possible if you have booked a flight that lands by 1200 hrs or earlier. After lunch proceed to the Aqua Fun Park with water sports (Optional: Jet Ski, Zorbing ball at extra cost) and obstacle area in a safe and enclosed area of the sea (Please carry change of clothes). In the evening proceed to attend the enthralling Sound and Light Show at Cellular Jail - (at 1800 hrs or 1900 Hrs, depending on light and sound show ticket availability) where the heroic saga of the Indian freedom struggle is brought alive. 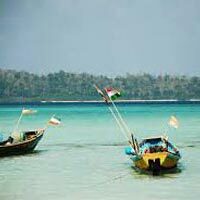 Relax and unwind on Havelock Island. 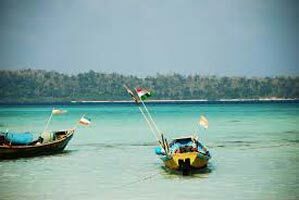 The beauty of Havelock Islands lies in the natural beauty and quiet pace of life. Walk down to the beach in front and relax and unwind. Day at Leisure. That is the best way to experience Andaman. OR Choose from additional activity chart with costs. After breakfast, at 0830 hrs proceed to Mount Harriet - the 2nd highest peak (365 meters high) in the Andaman, which offers a magnificent bird’s eye view of Port Blair’s adjoining islands (Must see: Spot where Lord Mayo was murdered/Largest Church in Andaman/ Rs 20 VIEW /Summer Bunglow of British/ The only kind of Mango tree in whole of S/E Asia/ Nicobari Hut). The summer headquarters of the Chief Commissioner during British Raj, this place provides fascinating views. Return back to Port Blair and start for a tour of places in & around Port Blair (1130 hrs) (City Tour) - covering the famous Cellular Jail*(a witness to the freedom struggle), Chatam Saw Mill (one of the oldest & largest in Asia), Forest Museum, Anthropological Museum, Fisheries (Marine) Museum, Naval Marine Museum (Samudrika).. At 1530 hrs proceed to Chidiya Tapu located 30 kms away from Port Blair and also called the Sunset Point in Andaman’s (Hot Tea will be provided). Return back to hotel in the evening. Evening at Leisure.